I am delighted to report that my cake topper (and first “commission”) has been featured in the latest edition of Well Wed New York magazine. This would not have happened without the amazing photography skills and on-trend design perspectives of my talented sisters at Alice G. Patterson Photography. Click here to take a look at the amazing dioramas they did for a letterpress designer and please be sure to leave them some “comment love.” If you or anyone you know is in need of wonderful photos of life’s big events and small occasions, give Alice a call (she travels too). Woo Hoo! That layout is beautiful! It must have been built around that gorgeous cake and topper! Congrats to you, Sis! You are famous. I need your autograph before you become too famous and forget me. This is so stinking cool! And, seriously, could not happen for a nicer, more sharing crafter. Yay! Oh how special! Your topper is just perfect. And those pictures are absolutely gorgeous. I am so proud of you! This is so impressive! Your topper is so beautiful– and just perfect on that page!!! Wow– perfectly photographed too. I love the simplicity and elegance of it! It really looks like it should be in a magazine so I am not at all surprised that it was chosen! I just came from your sisters’ site– thank you so much for the link! Those dioramas were fantastic and so much fun! Your whole family must ooze creativity!!! congratulations! the project is amazing and belongs in a wedding magazine! BTW: all your recent graduation projects are amazing! I love your U of R very much! Awesome! 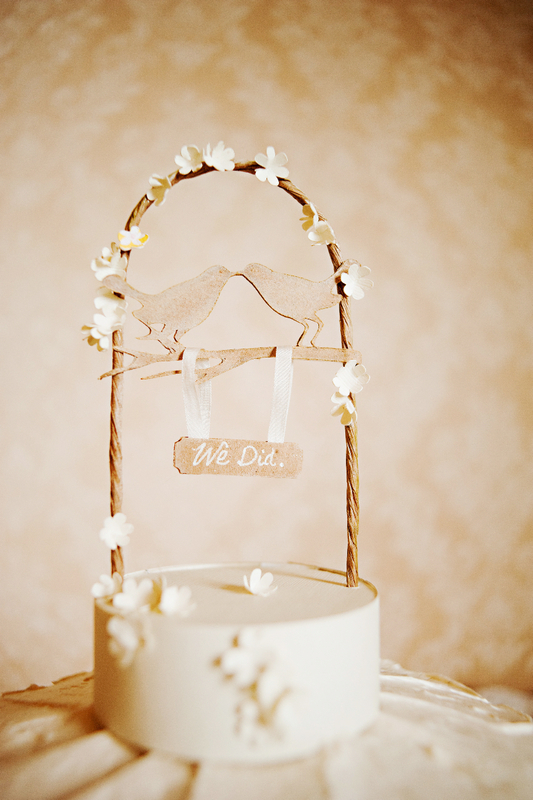 So happy your beautiful cake topper is featured. I love the photo. Sweeeeeeeeet!!! Love that topper and it is beautifully photographed! Congratulations on being published!!! Absolutely gorgeous!!! Congrats to you!!! So pretty! Congrats! How exciting!